Roaring Bill Kennedy was born on October 7, 1867, in Bellaire, Ohio, today a town of less than 5,000 on the Ohio River and considered part of the Wheeling, West Virginia, Metropolitan Statistical Area. In its heyday, shortly after Kennedy’s birth, Bellaire was known as “The Glass City” but lost the title in the late 1880s when natural gas was discovered in Findlay, Ohio, drawing most manufacturers from Bellaire to the west, where the region around Toledo and Fostoria became the new center for Ohio’s glass industry. Bellaire has experienced a more recent moment of fame, however. The Bellaire toll bridge across the Ohio River (now abandoned and closed) appeared in the 1991 film Silence of the Lambs. Stories abound that Kennedy was illiterate, but all of them cite nearly identical examples of his witlessness that are also attributed to players who preceded him to the majors. Kennedy’s actual education level remains unknown, as does most of his family history. What is known for certain is that his 174 wins during the decade of the 1890s put him fourth, behind only Kid Nichols, Cy Young, and Amos Rusie, all of whom are in the Hall of Fame. That Kennedy never quite achieved enough to join them may be largely attributable to his greatest failing as a pitcher: an utter inability to cover first base. He simply could never master the task and kept vainly trying to persuade his managers that it wasn’t part of a pitcher’s job description. Called “Roaring Bill” for his foghorn voice and the way he incessantly ran his mouth at the top of his lungs while ragging umpires, opposing batters, and even his own teammates, Kennedy, as per the July 29, 1899, issue of The Sporting News, frequently clashed with managers, most prominently Ned Hanlon (1899-1901), because of his tendency to constantly blame teammates for errors behind him, and umpires for the stunning number of batters he often walked. On August 31, 1900, he issued free passes to a National League record six consecutive hitters in the course of a 9-4 loss to Philadelphia and finished his career having walked the most batters (1,203) of any pitcher with fewer than 800 strikeouts (799). His volatile temper, argumentative nature and erratic control were nonetheless tolerated because his live fastball was nearly unhittable on days when he was right. After growing up on the Buckeye side of the Ohio River as a protégé of Will White’s while White lived in Bellaire, the five-foot-eleven and 165-pound Kennedy crossed the water at age 21 to pitch for Wheeling of the Tri-State League in 1889 and then joined Denver of the Western Association the following year. The lean right-hander remained in Denver in 1891, winning 20 games against 18 losses for the fifth place Grizzlies, and was rumored by several sources to be targeted for the Pacific Northwest League in 1892. But the February 13, 1892, Sporting Life wrote that “Kennedy, Wheeling’s famous brickyard phenomenon, is living at Bellaire, but is disengaged. The reason is plain. He asks $3000 to pitch this season.” The brickyard reference was to his place of employment during the offseason and was the nickname that accompanied him to Brooklyn when he received a last-minute offer in March 1892 from the Bridegrooms that we can safely assume was far less than his original asking figure. Although sporting papers periodically continued to refer to him as “Brickyard” Kennedy and current reference works still list that as his primary nickname, he was known to teammates and opponents almost from the onset of his arrival in the National League as Roaring Bill. According to the July 8, 1893, Sporting Life, he was also known sometimes by what some sources still today believe was his middle name: “They call Kennedy ‘Park.’ He is a Bellaire, O., boy, and was once called ‘Wheeling’s brickyard phenomenon.’ He has an arm of iron.” However, early encyclopedias list Kennedy by the middle initial of V., full middle name unknown, and both William O’Neill in The Dodgers Encyclopedia and Kennedy’s great grandnephew Scott Thomas Kennedy bear this out. Kennedy’s obituary in his local paper, the Daily Independent of Bellaire, Ohio, on September 25, 1915, furthermore illuminates that he was known to friends not as Park, the putative middle name assigned him by Sporting Life years earlier, but as “Perk,” simply a nickname. Kennedy had never ventured more than a few miles east of Wheeling before making the majors and especially not to a city the size of New York or Brooklyn. The February 24, 1900, issue of The Sporting News recounted that the rookie right-hander, after winning his major-league debut on April 26, 1892, at Brooklyn by outlasting Baltimore’s Sadie McMahon 12-10, bought a loud $50 suit with his first paycheck and then took his change in dollar bills so he could flash a big wad. Swiftly taken to the cleaners by New York sharps, an embarrassed Kennedy fled home to Bellaire, once there was cleaned out of the rest of his cash by “sympathetic” locals, and did not rejoin the Brooklyn team for several weeks. Even then player-manager John M. Ward did not risk starting him again until August 9 at Baltimore, when he lost a tight 3-2 rematch with McMahon. After that, Ward put Kennedy into the regular rotation, and despite his posting only one decision before the season was well past the halfway mark, he finished 13-8 and completed 18 of his 21 starts. By his second campaign, Kennedy was Brooklyn’s ace and remained the club’s strongest pitcher for six seasons. His career day came on May 30, 1893, at Brooklyn when he hurled two complete-game wins against Louisville, topping Billy Rhines, 3-0, on a two-hitter in the morning game of a Memorial Day doubleheader and adding the icing to his twin-bill win cake by beating the Colonels’ most popular pitcher, Scott Stratton, 6-2, in the afternoon contest. Even in 1899, when Kennedy lost his team kingpin status to rookie 28-game winner Jay Hughes, he bagged 22 victories, and another 20 the following year after Joe McGinnity replaced Hughes as Brooklyn’s top gun. When Kennedy’s arm revived toward the end of the summer of 1902, he engineered a tryout with defending NL champion Pittsburgh in the spring of 1903 and made the club after stopping St. Louis 11-1 in a trial game on April 27. Used only as a spot fourth starter since the Pirates went with a three-man rotation during most of the regular season, Kennedy assembled a 9-6 record in 15 starts, his last coming on September 26 at Pittsburgh when he lost 4-1 to the Giants’ Joe McGinnity. He was then pressed into action in the first modern World Series when one of the Pirates’ primary starters, Ed Doheny, had to be institutionalized on the eve of the Series with the American League champion Boston club, and a second primary starter, Sam Leever, hurt his right shoulder in a trapshooting contest in Charleroi, Pennsylvania, late in the season. On his 36th birthday Kennedy started Game Five at Pittsburgh in front of a throng of well-wishers who had made the trip upriver from Bellaire. 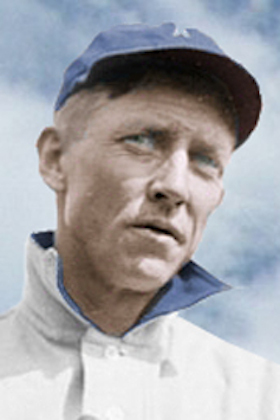 After battling Cy Young to a scoreless tie for five innings, Kennedy was undone when errors by Honus Wagner and Fred Clarke opened the gates for six Boston runs in the sixth frame and hastened his removal from what became an 11-2 Pirates drubbing in favor of rookie mop-up man Gus Thompson. It proved to be Kennedy’s last opportunity to display his famous temper in front of a big-league audience. He never again donned a major-league uniform after the final game of the Series, marking him as the first big leaguer to experience his finale in a modern fall classic. Kennedy toiled for two seasons with the Wheeling Stogies of the Class B Central League and then wrapped up the professional portion of his career with a three-year stint with the Dayton Old Soldiers of the same loop by going 1-3 in six appearances in 1908 at age 40. He continued to pitch with Ohio River semipro teams for a time before his health began to decline. Kennedy died of tuberculosis at his brother’s home in Bellaire on September 23, 1915, two weeks before his 48th birthday. This biography is an expanded version of one that appeared in David Nemec's Major League Baseball Profiles: 1871-1900 (Bison Books, 2011) vol. 1. In assembling this biography I made extensive use of The Dodgers Encyclopedia by William McNeil (Sports Publishing LLC, 2000), Sporting Life, The Sporting News, Find a Grave on the Internet, an article by Kennedy’s great grandnephew Scott Thomas Kennedy in the Wheeling, West Virginia, News-Register on August 14, 1988, and assorted box scores and sporting news items in the New York Times, Chicago Tribune, Washington Post and Boston Globe for details of Kennedy’s professional baseball career, 1889-1908, and his subsequent life. Kennedy’s major and minor league statistics came from www.baseball-reference.com.